They [photographs] are the proof that something was there and no longer is. Like a stain. And the stillness of them is boggling. You can turn away but when you come back they’ll still be there looking at you. I’m mildly worried about my plan for the workshop, “The Question of Palestine & Israel”: too ambitious, too complicated, too demanding? Anne Remley, my newfound Quaker Israel-Palestine cohort from Ann Arbor, agreed to be my vibe checker. She seems very knowledgeable and committed but told me she felt intimidated by the workshop design. I plan to offer this plan as one suggestion but gain feedback from participants before full launch. Since I’m a fairly experienced workshop leader I usually know when to stop planning, stop worrying, and put my trust in greater powers than I command. To be humble, to be sure I’ve done what I can, tried my best, and then let it go. These 2 dreams, as I slumbered on the campus in a dorm of concrete block walls, so far alone, a single soul in a double room: I was an expert in new graphic software, talking with a group of young men who were fascinated by it and by me. Maybe they were students of mine. I spoke authoritatively about the Beta version, prices, adaptability, ease of learning, etc, all as if I really knew what I was talking about. As I did. I felt pride and respect. In the second dream I was either at a trade show or orienting my students to a workshop, much like I’m scheduled to start tomorrow about Israel-Palestine. I was showing a video that had graphic images, testing it on them, curious about whether I was being too provocative. And so I am on the road once again, this time not to Israel-Palestine, or Amsterdam (I am remembering many blissful moments with M in and around our small hotel room) or the west coast or south where I hope to be in a few months, but more or less the center of Pennsylvania, Quaker country perhaps (tho I don’t know the history of this region), in a small town, Johnstown (named after an early pioneer, Mr. John from Scandinavia) known for its flood in 1889 (“2200 people drowned when the earthen dam holding back a man made lake for wealthy Pittsburgers (Mellon, Frick, Carnegie, etc) gave way up stream. Famous stories recount the tale,” so writes Anne Remley, whose grandfather survived the flood), the annual “Thunder in the Valley” motorcycle rally, and I suppose the university. Facilities seem limited, especially in the computer arena: wifi confined to one building, needing a password, only 2 computers for those not bringing their own. Luckily I did. This will curtail one important ingredient of my workshop, independent research. I decided not to bring my usual huge piles of literature, mainly because of the train, and planned to rely on an extensive resource list I recently updated on my website, a compendium, a graduate level seminar in the intricacies and horrors of Palestine/Israel. Not to be. Need to improvise, as I always expect to do. I suppose I could have inquired of the workshop coordinators or the Gathering coordinators to learn the awful truth. I didn’t, once again relying on presumption. And I was wrong. I must remind myself that most likely few would read while at the Gathering, and only a few more might read later. So, does it matter? The campus is rural, another presumption that proved an error—I thought it was an urban campus. Lots of hills, trees, grass, wide spaces, not easy for the physically impaired. It is quiet, pretty, and new. I arrived last evening on the train, which surprisingly was on time, perfect timing in fact, maybe because Amtrak might own the track on this route. I noticed many freight trains racing the other way, and a few passenger trains. We sped along thru coal country (some of the trains, one long one especially, going around the famed Altoona Horseshoe Curve, were loaded with coal), and along a river with a virtually unpronounceable name. Altoona, about 20 miles east of Johnstown, was a major RR town, created by Penn Central in the 1800s as a hub. With railroading in decline (altho it might see a resurgence with the end of oil) the town lost population. We stopped in what appeared to be the middle of a large train museum. I was riding in the café car, behind a dad with his 2 young sons. He pointed out the history to them, which is what sparked my curiosity. While waiting at the Johnstown train station for the shuttle to the campus we watched the zooming bikers roaring back and forth on a town main street in front of the main rally point. The Thunder in the Valley (aptly named) rally occurs annually, draws some 100,000 people, consists I suppose of music, meetings, displays, and tours and parades. What a contrast: between 8 mild mannered Friends waiting for the shuttle and the massive display of metal, testosterone and noise. Could two cultures be more different? What might their commonalties be? Of the population I noticed about half and half male and female. With one exception, all passengers riding high on the backs of bikes, clinging to what I assume are mates, were women. One woman drove a bike. One man rode behind another man. Women were usually blond, about half were portly, most looked past their prime. Except for being blond, I might say the same about the males. How would I photograph this? thought I, musing. Arriving so early I did not feel my usual angst and anxiety about setting up. I wandered around the campus, ducked into the student center for where I thought I’d find a café for a light dinner, but found instead the just closing dining hall, no one attending the check in place, food still set out, mostly dried out, the fish delicious, the veggies cremated, the fries desiccated, but all was edible and free, so I sat blissfully by myself in a nearly empty hall eating while reading over the pile of literature I’d accumulated during check in. Then the wifi facility, rudimentary: those pitifully few computer stations, a bank of tables in a large room for wireless workers, most sites distant from electricity plug ins, most of us having problems connecting. I did my work, the hour was late, nearly 10 pm, I was yawning uncontrollably, time to bed down. The Gathering: some 1500 Quakers assembled last evening for our first plenary, mostly a low key, sometimes jolly welcoming by our co clerk hosts, Marvin and Ellen Barnes. I met E a few years ago thru my photo workshop and we’ve stayed in touch. He is black, she white, she worked or works for Ford Motor Company, they live in or near Detroit. They are both articulate, they make an odd couple, both portly, friendly, she voluble. They explained the logo—a candle with a red flame encircled by two concentric circles, one brown, one black, with a thin white line between them, and a dove flying off to the right. This was designed by another friend of mine, Winkie Covintree, who I met at a previous Gathering some 10 years ago. The Gathering theme is “Courageously Faithful,” which elides perfectly into a sub theme E and M discovered later, the anniversary of the 1958 speech by Martin Luther King to Gathering at Cape May NJ, “Non violence and racial justice.” We can listen to a recording of the speech this afternoon and hear James Lawson, fellow worker with Martin and the man who I believe led Martin to non-violence. A perfect storm of events. I gazed into her eyes, thunderstruck, also fatigued, and couldn’t listen to much of what she told me. She’s returning to Canada, moving from her home in Winnipeg to Montreal for a new part time job, finishing her 2-year stint in the States with the Unitarian Universalists as a religious education coordinator. She collages and has a piece in the show which I will have to examine. I’ll then learn her name. Why did she strike me so resoundingly: she is tall, she has long black hair, she is friendly, she complimented me on my photos, she reminds me of Louise, and I am needy, more needy than I’d like to admit. I swim clumsily in a sea of couples at FGC, moms and dads, young lovers, elderly partners, young Friends courting, gay and lesbian couples, and then there are the singles, some of whom, like me, are probably wondering, will I meet my fated here? Is this person he, she? I’d hoped to supplement my skimpy copied materials by asking participants to do web based research. The lousy Internet access scratches that plan. On the brighter side, they’ve put me into a medium size auditorium with excellent audiovisual facilities—huge screen, bright projector, laptop hookup, and I presume good sound. This will all help my presentations and this is vital since one basis of the workshop is my photography. Being an auditorium the seats are fixed. Rose Marie and I located folding chairs we can use to form a discussion circle. Anne Remley and I finally connected. She is older than me by maybe 5-10 yrs, vivacious, energetic, and completely dedicated to the struggle for Palestinian rights. We’ve corresponded for the past month or so, she’s active in her Ann Arbor MI meeting, having met someone last year in Tacoma who excited her about linking Quakers with this particular struggle. They initiated a website. Her activism on the issue dates from a forum held at her meeting maybe 5 years ago that brought together a Quaker who provided context for a talk by an Israeli Jew ex soldier, female, and her Palestinian husband. Apparently, much of the meeting was electrified by this talk and decided then to form an action group, immediately going to the theme of action. Different from our group in Cambridge meeting which is more study oriented, more timid about engaging directly. With leadership from Anne who has graphic design skills they produced a postcard size rendering of the map showing the truncation of the West Bank. On the reverse side they’ve placed another map and 2 quotes from former Israeli Prime Minister Ariel Sharon advocating facts on the ground. A Jewish Friend criticized this as anti Semitic because it did not include statements by Palestinian militants calling for the annihilation of Israel. Assisted by her husband she’s distributed some 170,000 cards. I enjoyed nearly 24 hours of solitary bliss in my room before meeting my roommate, Paul Mays, from Richmond Indiana. However, such pairings often are memorable and turn out to be important connections. I met David Hartsough as a roommate, I believe in Oklahoma, and met him again last night as I came to my dorm, Hickory. He resides in the room next to ours. We share a bathroom. Bert Skellie, from Atlanta, also was a former roommate. Only about 60 New England friends made the journey, including Frank Gatti, Polly and Wendy, David and Kitty, Kim, Ghanda, David and Jane—the only ones I’ve met or heard about so far. I’ve opted for the 2 meal per day plan, saving some $35 but more importantly keeping me out of the thronged and sometimes frenetic dining hall at least for breakfast. I manage to collect fruit, milk and cereal after dinner, and eat that in solitude the next morning. After writing in my journal as I’m doing now. O brought 4 copies of Louise’s book for the consignment shop, and about 60 various sized photos of mine from Israel-Palestine. We share a table with Anne and her postcards. Will there be significant photo sales? Unlikely, if my sorrowful tradition persists. I gain not so much monetarily from this store activity but thru presenting my photos to a wider audience. The days and nights cool, at times stormy, winds blowing fiercely across the mountain ridges, west to east. Some rain, at times pouring down. Another unusual dream, this time not about M. I watched a withered old black man find a vinyl jazz record, also a record player. I could see in his face how he wished to play the record. He tenderly washed the record, fiddled with the player, and then he turned into me. I washed the record, fiddled with the player, extracted the needle, gently washed it. Others watched me, seemed to think me strange. I continued until I realized I would not be able to resuscitate the mechanism, I’d not be able to hear the recording if I proceeded this way. However, another method appeared to me, which I’ve forgotten now, a probable solution. Knowing how often wrong I’ve been before trying to assess a workshop I led after only one day I’m tempted to write, this might be one of my better workshops. 15 or so folks showed up, 4 more than had registered, and among them were 5 high school and college students, always a good sign. The group seems lively, spanning a range from virtually know nothing to know a great deal and have much experience; they had decent questions, participated fully, did not try to take control, seemed helpful to each other (one Irish man offered to read for Mick who has severely debilitating muscular dystrophy—later both dropped out), and no one expressed opposition to the tone or direction of the workshop. Someone outside the circle asked me if any were supporters of Israel—none appeared to be, and I’d not thought to wonder. On previous incarnations of this design people have enrolled who were my adversaries from Cambridge meeting: I shut myself down, silenced my voice—not their fault, mine. Using my usual blend of spontaneity and organization, we cruised thru an intro which included the first 2 sections of Facts on the Ground, my first show, made in 2004. Being in a moderate size auditorium helped enormously—the images were splendid. Today is the test: how many will return? And will they have done the reading? Of course this begs the question of how they’ll access the reading since I’d prepared for 12 and do not have easy access to a copier. And the computer access is pitiful. About 4 had read Lemon Tree, a few Bennis’s Understanding Palestine/Israel, so this is a problem. Today I plan to create with them a timeline which will include their personal connections with key periods of Israel-Palestine history. James Lawson’s talk last night was disappointing to me. Altho he exhibited the preacher’s style—standing in the center of the stage, radio miked, walking back and forth, using his hands and arms dramatically—his message lacked coherence or major point that I could recognize. It seemed too much a reiteration of old truths, rather than any new call. Organizing the talk—no text, no notes, he admitted that he’d prepared by writing notes but had little idea how they’d fit together—on the basis of perils and promises (which matches my design for the bearing witness workshop I will lead later this summer at New England Yearly Meeting sessions, “Some perils and blessings of witness against injustice”) he ended with promises. One was a call to Quakers to I think reawaken our social change energy, altho I’m in the dark about what exactly he was calling us to do. The 3rd of his 3 promises did register clearly: non-violence. He vividly depicted the promise of non-violence, as a tactic and a belief. This was the best part of his talk. I’d planned to meet with him in a small group after the talk for discussion but my disappointment vanquished this plan. Instead I sauntered over to the FGC registration area, perused my papers, and made plans for the week. A side delight so far has been meeting the tall, flowing black haired artist, CP. During the Lemonade Gallery opening—she has collages, I the Israel-Palestine photos—we chatted, sharing deep stories. Hers was about watching a loon lift off from the water, its wings barely touching, so that the reflections of the wing tips touched the actual tips. This led to her love of loons, and her sometimes use of them as images in her visual art and poetry. She told me about a novel, The Forest Lover, about a west coast artist, Emily Carr, which relates to trees. In exchange I told her my tree story, the White Mountain trees pleading with me to help save them, this in about 1981, during the height of concern, one peak among several, about nukes. Also the elm tree story, how I photographed it during its last years, exactly as I had my mother Pearl when filming her. I looked again more closely at her collages. Noticing that one incorporated images of forest fires, linked with little Buddhas, I mentioned to her the eerie correspondence in design between her key forest fire photo and the Hudson River Valley School of art, Albert Bierstadt in particular, his Yosemite paintings. Intense backlighting, small silhouetted creatures in the mid ground, massive forms on either side framing the image, and a plethora of trees. Bierstadt depicted the pristine, the lovely, the natural, the heavenly, the ennobling. The latter images show destruction. A long involved discussion at dinner with a two people from San Francisco, S and T. They’re both in a workshop with D, one of my main adversaries. S encountered D over Israel-Palestine. Apparently S had mentioned the importance of discussing Israel-Palestine—he’s Jewish, active in the movement challenging Israel— and D said after the session had ended, “We shouldn’t talk about this”. And walked away. This evoked S’s father, who when S was 21 and mentioned his opposition to Israel, hit him in the face. S hit his dad back. By D’s declaration not to talk about Israel-Palestine and his walking away, he’d become S’s father. I offered some background about D, that he tends to walk out of discussions that are not going his way, any discussions, not just about Israel-Palestine—T, being a nurse, realizing that D is a lawyer, stated, “This is somewhat typical lawyerly behavior (plus, D is a prof)” I also related the story of my breakthrough with D via The Compassionate Listening Project. If S and T and I meet again at the end of the week, or later (they might host a show thru San Francisco meeting) I could learn the outcome of their workshop. Martin spoke (on recording), followed by David Hartsough about his experiences during the Civil Rights era. 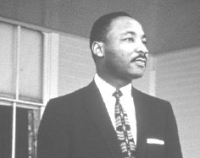 MLK laid out the tenets of nonviolence, and explicated love, the various forms of love. I’d quoted him to M, finding all 3, familia, eros (which originally meant love of the divine), and agape, fuse in my feelings about her. As I’ve written here before, Martin not only was one of the century’s greatest lovers, but he was an able scholar of love. If nothing else, I’d like to learn this from him. In another dream I was to care for an ailing toddler, a boy who had some sort of life-threatening illness. He sat in a portable contraption that aided him. I had no relationship with him and I’m not sure why this duty became mine. I took him outside. And then I decided to climb a small hill, leaving him alone, hopefully pleasantly sleeping. I discovered a set of 2 tunnels filled with rocks that kids apparently slid down. I decided to try it, knowing I might either injure myself or become stuck in one of the tunnels. Part way down a very narrow tunnel the dream ended but somehow I knew I’d pass thru the tunnel. But I worried that if he died I’d be responsible. And in a 3rd dream—FGC Gathering this year is a rich seedbed for dreaming—I was to meet a friend, someone like Stan. Before doing this a young teen boy tried to trick me by handing me a set of flaming toy pistol caps, all exploding. Before they could harm anyone I grabbed them from him and with my hand snuffed them out. I believe I found Stan later and told him about this episode. This was fun and I hope productive. We had little time for the slide show, Quaker’s in Israel-Palestine (Or John Woolman in a Land of Troubles). They asked that I continue the show today and in fact, if I heard correctly, give more prominence to my photos. This is gratifying. The plenary’s presenter last night. Rex Ellis, an excellent storyteller, continued the theme of “fire in the belly.” The stated theme, “Courageously Faithful,” encapsulates it. The reference to Martin amplifies it. James Lawson gave it personal references. And I live it, or try to. This is in contrast to the Yearly Meeting sessions I keynoted a few years ago, my presentation, “And you will be carried where you do not wish to go,” when I thought I’d struck a sour note, a wrong note, a discordant note, and few had joined me in the singing. Now I feel part of the chorus, uplifted and buoyed. This feeling of acceptance and being home trickles down to the serendipitous conversations at meals. Steve L, e.g., who I discovered yesterday is rooming with David Hartsough in the adjoining room, is one example. We check in with each other periodically. And Jennifer B who I had dinner with last evening, expressing her admiration for my work and witness, claiming she could never do anything equivalent. Maybe more about her later. Or at lunch yesterday sitting outside, one man noticing that someone had left 3 trays on the sidewalk and had simply walked away, forcing others to reroute as they used the sidewalk. My dinner partner eventually removed the trays after we’d discussed the ethics of such carelessness. So, altho I’m inclined to name us Quakers, the misfits, the malformed, the don’t fit in anywhere’s, the eccentrics, the odd balls, the malcontents, the bulbous, the rotund, the blobs, and I realize we are but a cross section of the US, middle of the roaders, there are exceptions, there are folks who are both bothersome and exemplary. Like the man who picked up the trays, maybe. Like me, maybe. Yesterday afternoon, rather than deciding which of the many sub gatherings I might join—non theism among friends, meeting for worship for racial healing, peace for the earth walk, or the film Amazing Grace, I opted for a relaxing open afternoon. I sought the nature area. I discovered only an overgrown nature trail and the athletic fields, then a huge building which at first I thought must have been a secret campus building, not shown on the map—it turned out to be an insurance company office building, Metropolitan Life. As I sought the nature area I dropped by a group of musicians practicing for accompanying the square dancing in the evening, and I slipped by a group playing volleyball. Both were tempting, I walked on by. Then a nap, squirreling up in the Living Learning Center, a small room for the attendant of the exercise room, on the floor, very snug, just what I needed. In the evening, after the talk in which Rex (a name that resounds since it will soon be applied to a newcomer to the human race, my daughter Joey and Leandro’s second son) became MLK talking about his early days in Montgomery, his fear—Rex sang one of my favorite songs, one of Martin’s, “Precious lord hold my hand”—rather than choosing among the multitude of activities, a small discussion group with Rex, contra dancing, folk dancing, the film I am a fugitive from the chain gang, an all gathering dance or the “FLGBTQC (Friends for Lesbian, Gay, Bisexual, Transgender and Queer Concerns) social, I found a quiet spot in the lower level of the Living Learning Center (sitting beside Mary Gilbert who appeared to be preparing her Fri. evening presentation about water) and checked email (very little coming thru that is personal) and read from accumulated articles, mostly about Palestine/Israel. I am so happy I brought my beloved computer to Gathering. Not only for the slide shows at workshop sessions, but to free write as I’m doing now, and to communicate even tho slenderly. It is my most reliable friend, an ugly commentary on me joining the multitudes of cyber addicts. One of my most fruitful periods of each day is now, the morning (6:32 am), the sun barely up, the room, building and campus quiet and still, me tuning to my dreams, however frightful or consoling they are, writing my reflections. I sit here with a cup of cooling instant coffee, the remains of my orange, Paul my pleasant roommate up and out somewhere for the moment, breathing deeply, relaxing, letting the feelings and thoughts swim out of my too tight body. Have I been doing much photography? No, only the morning worship on Sunday, a spectacular combining of painting singing observing standing silently, at the volley ball court, attracting many families, youth, elders, women. James Lawson standing alone on the stage. The portrait of MLK made by school kids under the direction of Winkie, made of dominos. Nothing of the natural world altho I’d hope to find something yesterday on my frustrating nature walk. And perhaps a few other subjects that I’m not recalling now. If I were asked to fill in the part of the form that asks my married status I might reply: single, divorced, separated, married, none of the above. Which means 1. I am essentially single, feel single, 2. I am truly divorced, having lived and loved and been loved by for some 25 years one woman, had kids by her, 3. I am recently separated from what my be the true love of my life, 4. I am married to my mission, my work, my direction, to love itself, 5. all the above, and 6. I am none of the above, finding none truly matches my perceived condition. Which is? And Quakers in the Israeli-Palestinian Conflict, the Dilemmas of NGO Humanitarian Activism, by Nancy Gallagher, info here.